Definition at line 108 of file llagent.h. Definition at line 113 of file llagent.h. Referenced by LLPanelGroupGeneral::postBuild(), LLAgent::processAgentGroupDataUpdate(), LLGroupMgr::processCreateGroupReply(), and LLAgent::setUserGroupFlags(). Definition at line 115 of file llagent.h. 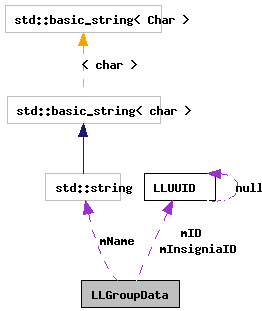 Referenced by LLAgent::getGroupContribution(), LLPanelGroupLandMoney::impl::getStoredContribution(), LLFloaterLandHoldings::postBuild(), LLAgent::processAgentGroupDataUpdate(), LLGroupMgr::processCreateGroupReply(), and LLAgent::setGroupContribution(). Definition at line 110 of file llagent.h. Referenced by LLAgent::getGroupContribution(), LLAgent::getGroupData(), LLAgent::getPowerInGroup(), LLAgent::hasPowerInGroup(), init_group_list(), LLAgent::isInGroup(), LLPanelGroups::leave(), LLPanelGroupGeneral::postBuild(), LLFloaterLandHoldings::postBuild(), LLAgent::processAgentDropGroup(), LLAgent::processAgentGroupDataUpdate(), LLGroupMgr::processCreateGroupReply(), LLPanelAvatar::resetGroupList(), LLAgent::setGroupContribution(), and LLAgent::setUserGroupFlags(). Definition at line 111 of file llagent.h. Referenced by LLAgent::processAgentGroupDataUpdate(), and LLGroupNotifyBox::show(). Definition at line 114 of file llagent.h. Referenced by LLPanelGroupGeneral::postBuild(), LLGroupMgr::processCreateGroupReply(), and LLAgent::setUserGroupFlags(). Definition at line 116 of file llagent.h. Referenced by init_group_list(), LLPanelGroups::leave(), LLFloaterLandHoldings::postBuild(), LLAgent::processAgentGroupDataUpdate(), LLGroupMgr::processCreateGroupReply(), and LLGroupNotifyBox::show(). Definition at line 112 of file llagent.h. Referenced by LLAgent::getPowerInGroup(), LLAgent::hasPowerInGroup(), init_group_list(), LLAgent::processAgentGroupDataUpdate(), and LLGroupMgr::processCreateGroupReply().